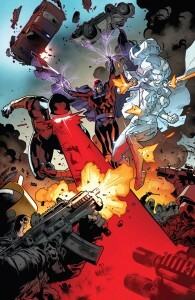 With the conclusion of Avengers vs X-Men we are left with a broken team of mutant superheroes. The aptly named All New X-Men tries to help recreate the world of X-Men by showing the division of mutant society. 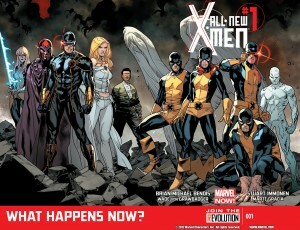 We begin with Cyclops leading his team grabbing new mutants to join his revolutionary cause. Then we get to see the other X-Men discussing how to deal with this problem. The issue ends with Beast coming up with a strange plan to bring the younger idealistic version of Cyclops from the past to confront the madman he has become. 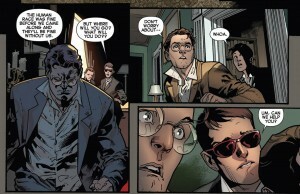 The writing is by Brian Michael Bendis which is going to make many comic book fans happy. His writing makes good use of several popular X-Men characters including some nice focus on Beast and the accelerated recruitment of new mutants from Cyclops and his team. The dialogue does have a few moments where it does not seem to flow smoothly, especially in the “what should be do about Cyclops” discussion. 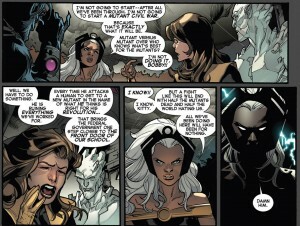 The past versions of the X-Men act as one would expect especially Beast who is very self-hating as a young mutant. 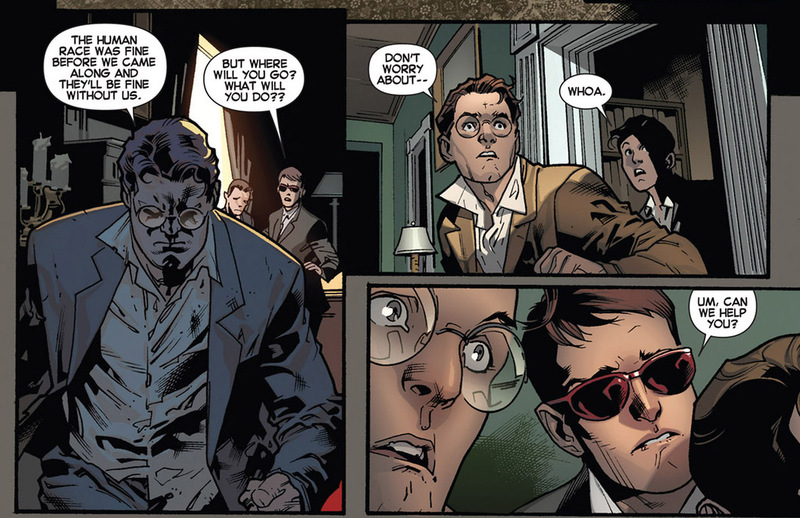 If you are a fan of Bendis’ run on Avengers then this will feel very familiar. The artwork is great. All the characters look good and the younger versions look like what younger versions of these characters should look like. I do like how Beast was drawn it is far better than other artists who give him a more “cat” look. Iceman has his more spiky transformation as he does in Astonishing X-Men, which is not my preferred design, but it is not by any means bad. The shading that is used during the team Cyclops scenes is also well done as it emphasizes the threat that this team is to humanity. The backgrounds are mostly average, but the design of Beast’s lab and the Golden Coast club are well done. This new series seems to be focusing upon the main issue of how to deal with Cyclops being a villain. Whether this becomes a redemption story for Cyclops remains to be seen. I hope this is not a redemption story as I like Cyclops as a bad guy, it fits his controlling and egotistical personality more than the moniker of hero (and yes I realize that in his mind Scott thinks he is a good guy). I do like the focus on Beast as he was always one of my favorite X-Men, but he is by no means the star of the story. Bendis is aiming for an ensemble story as is his style when working on Avengers and you can clearly see that is what he is aiming for with All-New X-Men. 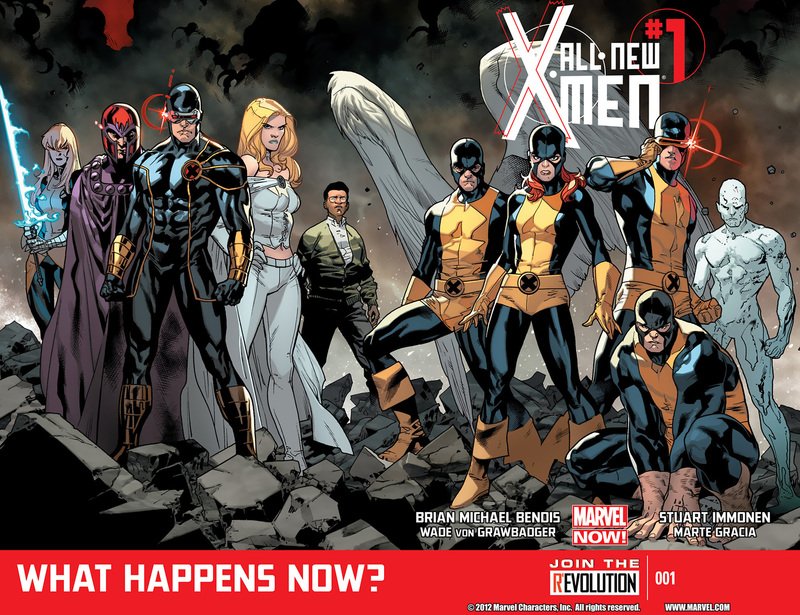 Finally, I would like to point out how stupid a title “All-New X-Men” is, it really lacks any creative touch when there are plenty of adjectives that could be used to differentiate the title. It will be an even stupider title after a couple years pass and it is no longer “new”. Despite all that, it is an interesting beginning to this series and it does have a great team that delivers this story with very few flaws.